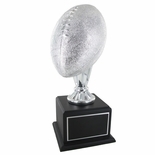 Item description: 17 inch football trophy comes with 10-1/2 inch diameter silver metal ball, plus stem mounted on black wood base, and 5 x 3 inch black screened engraving plate. Engraving Options: A laser engraved text and logo on black plate shows silver over a black background. Please upload your artwork files at the time of check out.